This year I submitted the session outline copied below, to the Music Education Expo, Manchester and was fortunate to have been chosen to deliver this presentation alongside fellow freelance music education consultant Alan Cameron at the event in October. I didn’t end up giving the presentation as I was working elsewhere, but I am looking forward to wrapping this work into a new creativity pilot project that I will be working on in 2019. As I was reading Martin Fautley’s latest blog and subsequent comments and discussion which calls asks for some consideration of similar points in the context of KS3 music in the UK, I was reminded of this report and the presentation and workshop I had planned to give. It got me thinking about how much attention we pay as music teachers to how we can create and nurture an environment in which both students and teachers can explore creative approaches to music education – both in teaching and learning – and navigate the barriers that are thrown up along the way. So I’m off to tackle my farily extensive ‘creative education’ reading list for the Christmas holidays. Any suggestions for what should be on it? for whom and why they learn (e.g. not just for themselves or for future employers, but also for their fellow citizens, society and industry, and for the world as a whole). As part of a new partnership announced in 2018, Musical Futures International and Soundtrap have been exploring their shared vision for expanding opportunities for teachers and students to better embrace creativity and collaboration that starts in the music classroom but that isn’t limited by location, space or how people engage with music learning. A synergy of hands on, engaging, practical music workshops and new ways to collaborate creatively online using cloud-based platforms across a range of devices has opened up new ways to embrace self taught learning within the more formal structures that traditionally exist within music education. This session will explore through a practical workshop some of the points raised in the UNESCO report and model ways to start to acknowledge, use and nurture them in the classroom. 2) A practical workshop will establish key musical ideas from within the group and model the building blocks of composing and improvising. This will then lead to a practical example of how these can be supported and built upon using music technology both within the classroom and in students’ own time. 3) Delegates will be provided with a resource to use with their students to build on the learning from the session. There will be an opportunity for discussion and the sharing of ideas for how this might have an impact on classroom practice and to address some of the challenges that are raised by the UNESCO report. Music teachers in Herts are invited to submit an expression of interest in being part of a pilot project looking at music and creative education supported by Herts Music Service and being run in partnership with Melbourne Graduate School of Education, Geelong Grammar School and Musical Futures International. Two teacher pilot groups, one in Australia and one in the UK will be asked to trial some ideas and to feed into the associated research. There is very little professional development available for teachers to support the General Capability of Critical and Creative Thinking. We are investigating the impact of aspects of the RISE Model of Creative Education on the music classroom and the outcomes for teachers. Specifically, we will identify teacher perceptions of creativity and teacher outcomes in the areas of professional development and practice. This project is part of a larger, international study and the Model and these strategies have been trialled across F-12 at the Geelong Grammar School in Victoria for 18 months. We are looking for 20 teachers, primary, secondary or instrumental to form the UK pilot teacher group. trial, observe and reflect on your classrooms in relation to the Environment and Student indicators from the RISE model. If you are interested in taking part, please complete the expression of interest form HERE and we will email you a teacher consent form and further details of the online and face to face training events. We will send you a consent form and information about the project. Once the dates for the training sessions are organised, you will be invited to attend. In the last few months I’ve been considering some key themes in music education discussion and debate. Recent travels have got me considering the term ‘music education’. I’m thinking about the structures, traditions and conventions that sit behind the delivery and receipt of a music education, some of the values that go alongside that and what we might be able to learn from how it all works in other countries. Are there any constant ingredients in music education that transcend any different connotations of the term music education or beliefs about how it should be delivered and what should be contained within it? Is music education about the mastery of a musical instrument as it is in China? Ask about music in government schools there and the response is quizzical – well what does that have to do with anything? How about the American band model, large group instrumental learning which is firmly embedded into the school system. No graded music exams there! Or the UK where calls to save music education often conflate music education in school with instrumental instruction and where one seems to be thought to hold a higher value than the other? With all of those examples, of course the one constant in music education is music, in all its different forms and genres and structures and sound and timbres. But what of pedagogy? Could a better understanding of pedagogy help to remove barriers that stand between the student and the music that sits at the heart of music education? Most of my work in other countries has been for Musical Futures Australia (now leading the global expansion of MF into Asia, the Middle East and beyond as Musical Futures International). MFI is having a growing impact in primary and secondary classrooms, last year working with around 2000 teachers and impacting on roughly 330,000 students in the USA, Asia, Australia and New Zealand. At the heart of the workshop programme is the pedagogy that Musical Futures is built on. The recently released independent evaluation of the Victoria government-sponsored Musical Futures professional learning program contains some impressive evidence of that impact, with the headline statement that 97% of teachers believe that MF removes barriers to participation – a great accolade to the work of the Musical Futures Australia team. You can read and download the full report here. So here is an approach to the delivery of music education originally designed for use in the music classroom and it seems to be working. So is that approach transferrable to other ‘types’ of music education? The work Musical Futures International is doing in China is proving to be one of the most interesting experiences I’ve had as a teacher, working with instrumental teachers who don’t speak English and on our most recent visit, with children and their parents as well. I’ve also been delivering workshops as part of my freelance work in the UK for instrumental teachers at Music Education Hub events exploring creative approaches to instrumental teaching and how and why those might bring value to the teaching of instrumental music. For years, Musical Futures has skirted around whether the pedagogy and approaches have any relevance to different instrumental learning situations (one to one, small group, ensembles, whole class ensembles). It’s easy to see a link between the pedagogy of whole class instrumental learning and Just Play for example, each being large group approaches to music making designed to take place mainly in schools with students of varying experience and enthusiasm with the teacher as music leader playing with and leading the ensembles and usually with repertoire or resources as the basis for learning. But could Musical Futures also invade the sanctity of the one to one instrumental lesson, that gold standard, globally understood backbone of music education? It comes with its own embedded assessment system, the graded music exam, and a tried and tested progression route to conservatoire or university music degree (with a couple of stops for GCSE and A Level music along the way). From feedback from the teachers and organisations we have worked with in China, surprisingly in a system where most of the teaching is on a one to one basis, it seems that the pedagogy is resonating. Key to this is hooking in to the teacher and making it relevant in the context of their own music education. In keynotes and presentations to teachers where there is a translator available I have tried to do this with some reflections on my own music education (in the workshops, we just play and learn that way!). I talk about how learning to play the drums showed me how a groove is a key part of the energy and the lifeblood of the music whether there is a drum kit in the piece or not (Baroque motor rhythms or the lilt of the suspensions and appoggiaturas that thread through Mozart’s fabulous Requiem). Learning a bit of guitar and to play chords on keyboards along with songs I knew helped me to understand the underlying patterns of harmony in music I played far better than the years of Bach Chorales and my appalling failure to write a fugue in my 1st year of my degree course. Singing has helped me to hear, create and replicate melodic lines, patterns and intervals. And jamming in a large group on an instrument I can’t play very well, has helped me get better at listening to and copying other, better players in order to become better myself. Embracing other musical experiences has made me a better musician. That wasn’t part of my music education at school or in my instrumental lessons and ensemble experience outside the classroom and it seems that it wasn’t part of the Chinese music teachers’ music education either. I have also learned that it is possible to communicate learning for teachers, even when there is no shared language. The emphasis that Musical Futures International has brought to the scoping of the international work, in places where music education may not mean the same as the countries where MF was originally tried and tested, is that there are many ways to learn music. 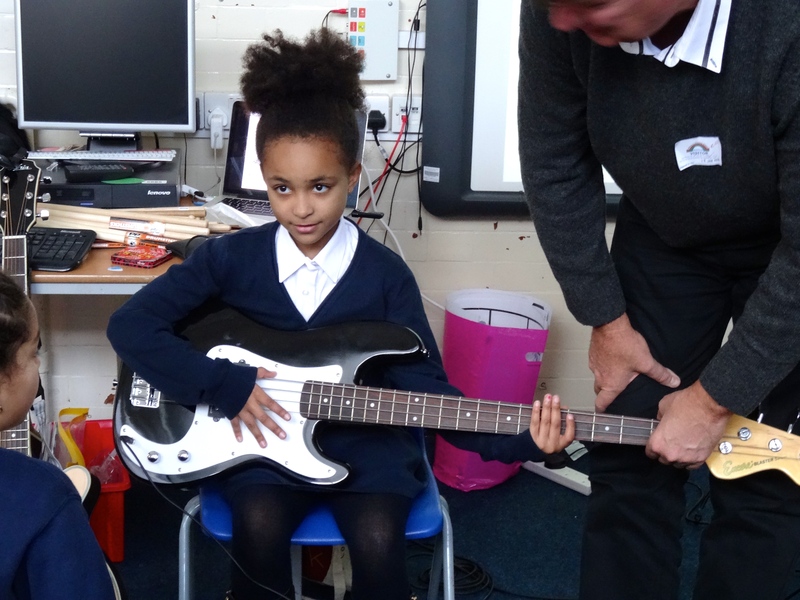 Musical Futures helps teachers think about how and why they teach it. And so we learn about an approach and pedagogy with music as our shared language. We even managed some songwriting using some of the ideas in this free guide to songwriting. The songs sounded great, but I have no idea what they were about…..
And finally what about our personal relationships with music that perhaps brought us to teaching in the first place? I felt the complexities of music and its importance in stunning performances played on traditional Chinese instruments in Bejing where for the first time I heard the timbres and tones of instruments I had previously only memorised the names of for an exam. I adored the performance of the Azerbijan National Symphony Orchestra who played at the opening of the ISME 33rd World Conference in Baku which reminded me how much I love orchestral music, how important playing in an orchestra was for me at school and beyond. I don’t know if my music education enhanced those experiences for me, or whether they were just moments captured and brought to life in ways that only music can. I don’t believe you need to be musically educated to love and appreciate music, but I do know that my music education brought me into all kinds of music I don’t think I would have found on my own. What I have learned from all of this is that music education is far from a simple matter of how music is taught or how it’s learned. But I do believe that the richness and value of music deserves a place in education, if we can find a fit that embraces all nuances of music education regardless of how they are described or implemented. This week I spent a really interesting morning leading a workshop for Trinity College London and Music For Youth with a group of experienced music education sector folk to look at mentoring and feedback. There were 2 specific aims of the session. To identify what the terms “inclusivity and diversity” mean in the context of assessment and feeedback and the second was about how our own musical identity and musical journey can influence how and what we feed back. We started by taking it in turns to share the journey that had brought each of us to that room on that day. What came across was a very real drive to want to give young people similar musical opportunities and musical experiences to those that we had all been part of. Common themes and shared pathways emerged, and for some there were emotional moments as people recalled events or experiences along the way that had had a very memorable impact on them. The next step for most of us was to then become involved with the county music service in some way, usually to play as part of an ensemble. All of us had been teachers or composers or performers of music at some point in our careers. For some, although it was primary music that hooked them in, secondary school music hadn’t been of particular relevance (not the case for me, but definitely a theme in discussion). It was at that point that the musical pathway seemed to divert to routes that existed outside of school. Perhaps those of us who took part in that session are very much products of the music education focus, structures and values that were prevalent during the times that we came through the system. Perhaps we just followed clearly defined pathways that were laid out for those of us that happened to find ourselves on the first step no matter what it was that helped us to take that step. I left the session wondering whether those same pathways to and through music education still exist. And if they don’t, whether we have been successful in replacing them with new ones. Should we be looking for musical pathways that accommodate new ways of learning, tools to help us to be creative, different ways of hearing and making music and a range of approaches embedded in structures that underpin a completely musical education? All of this sits within a shifting educational landscape in the UK which threatens arts and cultural education in ways that I would have found it hard to imagine back in the days when the photograph at the top of this post was taken. And so to part of my story. When I was in Year 6 in my tiny village primary school where music was the life and soul of every day, we wrote, performed and recorded our own ‘Masque’, supported by our teachers. All of the top classes were involved with the drama, words, lyrics, music, costumes, scenery and it occupied months of planning and creating and rehearsing and presenting (no SATs to prep for in those days!) until eventually we found out we had won a national competition to perform ours at the Royal Opera House in London. I played a recorder solo that my best friend had composed and that the whole class had devised words and a melody to fit with. There was no question that after a primary school ‘first access’ musical experience that ended like that I would continue with music. I learned to play the clarinet (paid for by my parents), attended a music centre every week, I went to a secondary school with an incredible music department, symphony orchestra and concert band, I was part of the County ensembles and that pathway led me to a music degree and into music teaching and beyond. My musical pathway was clearly laid out (for me) in front of me and I followed it. So my thinking this week has been about whether those pathways still exist and if so are they still the most relevant ones that can truly embrace inclusivity and diversity, whatever that means in the context of where and how we are working? If not then what might replace them? Is it time to refresh the old and embrace the new and if so, then how can we do that when the experience of so many now running the show was so much ‘of its time’? My worry is that if we can’t find a shared vision and approach and set aside our own musical identities in order to embrace those of others to make this possible, then we risk the vibrancy and creativity and excitement of music making being lost to many. I’ve very much enjoyed recent reading about the history and context of music education in the last 50 years, particularly the writings of John Finney, Gary Spruce, Neryl Jeanneret, Ruth Wright and others that add a huge amount of context to the every-day experiences I encounter when I am working with teachers and reflecting on my own experiences. Life without music is meaningless, music without life is academic. Back in November 2017, I was invited to be part of a panel at The Music Mark Conference entitled “Securing the Future of Music in the Curriculum – Instrumental Skills v Music Knowledge”, a title which forced me to hone some thoughts into a 5m presentation and which I have continued to reflect on since. The panel was co-ordinated by Dan Francis who has summarised his presentation in a blog post here and this is a good overview of some of the background to the choice of title for the session as well as some insights into the current music education sector in the UK. I chose to focus on the skills vs knowledge aspect of the title and I had in mind mainly KS3 music because that’s the most likely place most students will get some music at school as the entitlement to music in UK state schools continues to diminish. I hear quite often now about music teachers choosing to follow a ‘skills-based’ curriculum at KS3. Looking at some of the online discussion and in visits to schools, this approach looks to be students learning music through playing music, the musical knowledge and understanding then growing from the experience of actually creating something musical. When thinking at its most basic level about a skills-based approach, I think about the idea of learning to play a musical instrument in a classroom context. With this in mind I am reminded of the year 9 class all sat at keyboards wearing headphones playing Ode to Joy on Keyboards from notation. In this scenario, the learning starts from prescribed repertoire using materials that have been chosen or made for the learners and the music itself often only exists after the process has been completed. To access the task, students in this class need to know how to use the materials they have been given. (It might help to have heard the music as well, but it isn’t essential to have done so). As a contrasting example, the teacher leading this class at Shrewsbury International School, Bangkok, also follows what he calls a skills-based curriculum. In this lesson, year 7 are getting under the skin of Electronic Dance Music through playing along, breaking down the patterns and then composing their own beats to then be transferred to computers. Later the sounds can be manipulated and explored through technology. The teaching starts from what exists within the music and builds from there. Students in this class need to know how to respond to the music they hear and adjust their responses appropriately. For them, the answers lie within the music and finding them is an experience of discovery. It seems there’s some variety within this ‘skills-based’ approach. So digging deeper, can we define a difference between developing instrumental skills (in the sense of knowing how to play something) as the first example suggests and ‘musical skills’ (a bit more holistic) in the second? And does one approach engage students more than another? Or perhaps it’s not the curriculum content and choice between skills or knowledge that’s important after at all, but the teaching, the approach, the relationships? And so what of ‘knowledge’? First we have Nick Gibb’s narrative about the importance of the ‘knowledge-rich’ curriculum, this recent speech being just one example, see his Twitter feed for more! I’m not sure I’m confident about what this means in practice for music especially when you throw in the multitude of other seemingly diametric options available to teachers informal/formal, theory/playing, notation/no notation, prepare for GCSE/prepare for something else and on and on and on it goes. John Finney has recently written a series of blog posts articulating the need for some clear pathways through the ‘conceptual confusions’ around all of this and he articulates this so much better than I can. Should this debate be better defined by musical pathways, for example by the content in GCSE/A Level (and international/vocational equivalents)? These seem to test some aspects of musical knowledge, understanding, theory, language etc. at a point at which making a judgement about the effectiveness of music education in schools seems logical. The balance of skills and knowledge within such qualifications is apparent, yet the concept of KS3 as preparation for GCSE when just 6 or 7% of students take that qualification doesn’t feel right either. Perhaps what’s being tested at this level doesn’t always join up to that aspirational line of progression through classroom music in ways which make it easy for music teachers to bring students through in just a classroom setting. ie. Do GCSE and A levels in music really test what can be achieved only through a classroom music experience regardless of whether that’s skills or knowledge? I’m not convinced they do and it doesn’t help teachers find a simple route through this minefield of choices and decisions. Perhaps the answer lies in what it means to be ready to take GCSE-so defining the required balance of skills and knowledge (and ENGAGEMENT with classroom music) necessary to access those examinations courses. Arguably it’s a failure to find a balance between all 3 of these essential ingredients that have resulted in the precarious situation music is now in in schools with its low numbers, high costs, just for the few and irrelevant to the rest. Chuck in the appalling lack of subject specific CPD for music teachers and the decline in university-based teacher training and it’s no wonder we don’t seem to be making much progress (pun intended) with all this. Despite the wealth of research, papers, journals, chapters, books that exist on the topic of music education, many teachers still end up with a KS3 pick and mix of topic-based 6 week ‘schemes of work’ that follow the listen to music, be told about the music, play some of the music (if you’re lucky) go into groups and make up some music, perform and assess and then repeat pattern, with little consideration for exactly what is being learned (and built upon) in terms of skills or knowledge. So what happens if you strip out all the background noise and just look at what is in front of you. Then what might be found? My next two posts will unpick some experiences that have helped form some of my thinking about this. The first, published as a guest blog for Musical Futures International, is about what happens when all you have between teacher and learners is the music. The second is about what happens when students make some of the choices and what can be learned from that. But I want to finish with something that Steve Jackman, teacher of the year 7 class in the video above said when he summed up his approach to music in his school. If you spend 3 years learning about swimming, you would expect to be able to swim at the end of it. Perhaps after all the answer is that simple. Start with the end in mind.